"I am really glad I was born the time I was because I wouldn't have gotten the education I had. Geez, that's frightening. I can't imagine not being able to hear teachers talk about chemistry, physics, or English. I can't imagine someone limiting my abilities that far." Full Review Disability Studies Quarterly: "This quote begins Freedom Machines, a documentary about the significant impact of technology in the lives of people with disabilities. But the documentary also covers the unfulfilled promise of technology for many. It does an excellent job of documenting what might be called the rampant "technology discrimination" that faces many people with disabilities daily. The documentary illustrates how far technology has come in assisting people to live full lives within their community, but it also shows us how far we have to go as a society to get this crucial technology into the hands of all the people with disabilities who need it. Through a series of profiles of people with disabilities using technology in their lives, the documentary shows daily living and educational pursuits enhanced by a variety of assistive technologies. Susanna Sweeney-Martini, a college student from Spokane, Washington, is the first person shown. Her power wheelchair and her voice-input computer help her pursue her goal to become an oceanographer or marine biologist. It also illustrates her leisure activities as she wheels up and down the soccer field as an umpire or has lunch with a girlfriend in a college cafe. But the profiles of the young people are interspersed with interviews from their parents, who explain the constant challenges to get adequate technology for their children. Although the Americans with Disabilities Act (ADA) and the Individuals with Disabilities in Education Act (IDEA) are supposed to legally guarantee accommodation for people with disabilities, many continue to face inequities and lack of services and technology. One of the more compelling profiles is of Latoya Nesmith, an African American, Albany, NY, high school student. She has a true passion for languages and wants to become a United Nations translator one day or write a Polish opera (because she thinks the Slovak languages get short shrift). But she has to educate her teachers about the assistive technology that she needs to reach her educational goals, such as Intellikeys (which is a programmable enlarged keyboard that can be connected to any computer to assist someone with limited hand mobility). One can see the frustration she and her mother face as she diligently worksmany times without the added technology she needs to move forward. A half a dozen other people with disabilities are featured with stories similar to Latoya's people fighting to build careers or get educations without all the technological support they need. The documentary does give hope, however, because it illustrates that the needed technology does exist in most cases, from improvements in hearing aids to the IBOT, the wheelchair that climbs stairs. The documentary premiered on PBS around the country as part of the 'POV' documentary series in September 2004. And that is the perfect audience for it. For people from the Disability Studies world, the documentary tells a story we already know. However, the general public and our students unfamiliar with disability issues should all see this documentary to truly understand the "technology discrimination" that faces so many Americans with disabilities." Full Review: Booklist. "In this compelling video about the possibilities of human achievement, viewers meet several physically disabled individuals (young and old) who lead dynamic, productive, and relatively independent lives thanks to assistive technology. Battery-powered wheelchairs, voice-enabled word processors, text-to-speech screen readers, programmable keyboards, and touch-face switches are among the items that aid persons lacking full mobility, vision, hearing, and other capabilities. The Americans with Disabilities Act promises equal access to education, employment, and essential services, yet the vast majority of America's 54 million disabled still lack helpful technological devices. "Freedom Machines" sounds a call to action. Several disabled individuals, disability advocates, and inventors convincingly argue for access to technology that helps improve quality of life." "First broadcast in September 2004 on the award-winning PBS series POV, Jamie Stobie's remarkable documentary reminds us how woefully uninformed--even at the dawn of the 21st century--society remains about issues related to disability. An enjoyable, progressive, inspirational survey of assistive technologies, this film serves a much-needed dual purpose: showing a variety of smart and determined people with disabilities working hard to gain acceptance and viable futures in the public mainstream, while also illustrating how new technologies are making it possible to gain access to previously unavailable services and activities. Laden with none of the sugarcoated sentiment that is so common in films about disability, the documentary also examines the benefits of the Americans with Disabilities Act (passed in 1990), while pointing out that a lot of social, political, and institutional obstacles still prevent many people with disabilities from fulfilling their highest potentials. Making a strong case for assistive technology as a human rights imperative and a sound fiscal policy, "Freedom Machines" manages a near-perfect balance of compassion, humor, political insight, and deep admiration for the people it profiles--individuals whose lives have been significantly improved by new technologies that bring hope where none existed before. ***1/2 Stars. Highly recommended." "The award-winning documentary, Freedom Machines, originally seen on PBS' Point of View series, has recently been released on DVD. If you missed it the first time around on television, don't miss the DVD version. We've been waiting for this film, which captures the essence of the magic technology offers to all of us. Freedom Machines highlights the difference it can make, especially for those of us who through birth, accident, or the aging process, have had to transform our lives around new physical or intellectual conditions. 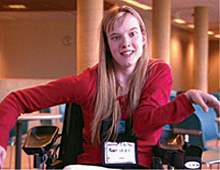 We meet Susanna, ready to go off to college, having grown up with tools to overcome the challenge of cerebral palsy. New voice input software is the best tool to come along for her since the motorized wheelchair. Floyd, whose accident left him a quadriplegic and in a nursing home but did not rob him of his determination to use technology tools to obtain employment and live independently. We learn about Shoshana, among the first to use an adaptive keyboard. She taught her teachers how much she had to contribute to the classroom and is starting her own business, renting videos with built-in audio descriptions for people with visual impairments. Another scenario presents Gladys, who is losing her hearing and feels cut off from life. But her attitude brightens while learning to use devices that translate spoken words through the telephone into a keyboard, increasing her ability to communicate with those who are important to her. She's not willing to give up her active life and she doesn't have to! Bonita, born with a severe visual impairment, was thrilled when she could leave the School for the Blind and go to a regular high school. She's a successful mom and has a full lifebut employers have trouble seeing how technology tools compensate for her vision loss. Latoya contributes actively in her public school classroom and uses a variety of technology tools as she thinks about her goals in lifetranslating operas into Polish, for example & These stories challenge our thinking about what is possible: while we have come a long way in developing tools that can benefit all of us, at one time or another, or in situations none of us might have predicted, our attitudes, policies, and practices have not. We have the requirement in every child's IEP, for example, that technology needs be assessed and addressedbut lack of training, fear of lawsuits, and lack of resources at the school site keep us from assuring that students have the tools they need for success in their chosen dream. Even more important, we overlook the breakthrough inventions that have changed the lives of all of us: the curbcut, the automatic door-opener, the built-in screen readers in computer operating systems. Imagine a school where technology tools were available for every child (not just those with disabilities) who needed a way around an obstacle at a particular time. The new DVD, created with universal design for learning principles built in, is a perfect way to create awareness, empathy, and action for school administrators, teachers, parents, employers, and students. It is fully bilingual (Spanish-English), and contains video descriptions (for those with visual impairments), captions (for those with hearing impairments), and talking menus. The DVD's chapter format enables the user to focus on individual scenarios, or on the added resources on legal rights, universal design for learning principles, lesson plans for using the DVD, resource lists, and so much more."